DISCOUNT PRICE ! Old original price - 3800 €. 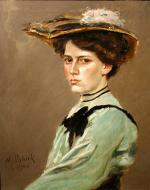 Bright impressionistic portrait of a lady in hat was executed by French painter Maurice Polack (Polak), active in Paris in the end of the 19th - early 20th century. 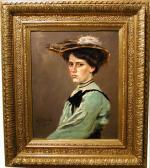 The painter was member of Societaire des Artistes Francais from 1883 and exhibited there. Polack is listed in: E.Benezit, Dictionnaire des peintres, sculpteurs, dessinateurs er graveurs, Gruend, 1999. Inscription: signed M.Polack and dated 1904, lower left. Technique: oil on canvas. Original partially gold-plated frame.